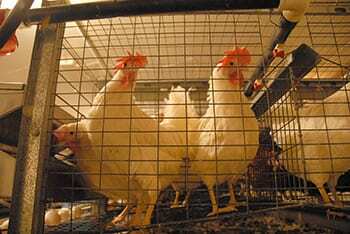 Interested in sharing your view on whether the proposed standards are good enough for hens? Recommended practices: Do you think any of the recommended practices throughout the draft code should be requirements? If you’re interested in more areas for improvement, feel free to contact us. Don’t miss your chance to speak out for egg laying hens and pullets in the Canadian Code Public Comment Period, live now until August 29th, 2016! For the first time, Canadians are being asked for their input on our national standards for egg farming. Don’t miss your chance to speak up by commenting on the Canadian Code of Practice for Egg-Laying Hens. Millions of hens are counting on you to make a difference! Ninety-five per cent of Canada’s hens are housed on conventional egg farms where they spend their entire lives in cramped, barren battery cages. This can lead to extreme frustration, brittle bones and an increase in negative stress-related behaviours like feather pecking. However, a better life where birds can stretch their wings, roost and perch, nest, forage for food, and give themselves a dust bath is possible – we just need your voice! Your comments will be taken into consideration when creating the new standards of care for egg-laying hens, so make sure to visit the National Farm Animal Care Council’s website and share your thoughts about what kind of lives egg-laying hens should have. Do your part in keeping Canada’s hens happy; contribute to the public comment period now!